So you‘ve been invited to a Polish wedding – but have no idea what to expect. Culture.pl walks you through the day…and late into the night. It is perhaps not a surprise that many Polish wedding ceremonies are still held in churches. In a country where so many people have at least some ties to the Catholic Church, this remains an important part of many couples’ wedding plans. Though fashions have certainly changed in recent years, guests might want to consider standards of modesty when in church. Longer hem lengths and covered shoulders were once obligatory, and should be kept in mind for more conservative affairs. Otherwise, take this opportunity to dress to the nines – a Polish wedding is no time to slack off sartorially. The Catholic ceremony itself is similar to Catholic rites anywhere, though those who understand the language might be surprised by the frequency of rather “traditional” vows. Wives often pledge service and obedience to their future husbands – though of course this might well reflect an observance of tradition, rather than an actual picture of the future relationship. Those accustomed to large wedding parties will notice that many Polish couples choose to restrict the number of guests. The pair are typically joined only by their witnesses, normally family members or very close friends. Two selected witnesses accompany the bride and groom at both civil and church ceremonies. Recent trends have seen bridal parties grow; though if you see a couple with only two attendants, it’s not for lack of friends, but rather in adherence to custom. ​A full Catholic ceremony can be long. While you’re listening, take a second to see if the bride and groom have observed a number of old superstitions. When she is walking down the aisle, it’s crucial the bride not trip over her veil. Since it also is critical that she not look back to make sure it’s properly positioned, responsibility for minding the veil falls on the bride’s attendant. Next check out the bride’s shoes. Tradition has it that they mustn’t be open-toed – future wealth and fortune would fly right through the open toes. The wrong shoe is not the only accessory choice that can doom the marriage; custom dictates that brides never wear real pearls, as they will bring a lifetime of misery. If you see the bride subtly move a patch of her wedding dress to cover the top of her groom’s shoe, she might be following the old belief that this will give her a position of dominance in the relationship. Those worried about the future of the couple also should keep an eye on any candles lit on the altar. Tradition says if one goes out during the ceremony, either the bride or the groom will die young. Also, odds are if you’re at a Polish wedding, the name of the month probably contain the letter "r" (in Polish, that includes March, June, August, September, October and December). It’s thought that these months will bring good luck to a marriage and are thus the most popular times to plan a wedding. Having made it through the ceremony – hopefully without inadvertently cursing themselves to an unhappy future – the newlywed couple will exit the church as husband and wife. Where this moment is often accompanied with the throwing of rice, you likely will find that guests in Poland shower the newlyweds with coins (some Polish coins are quite small, thankfully). This is an adaptation of the traditional custom of throwing grain at the couple to ensure a prosperous and productive future. The coins, similarly, represent wishes for a successful future. Now that the ceremony is over, it’s time for the party to begin. 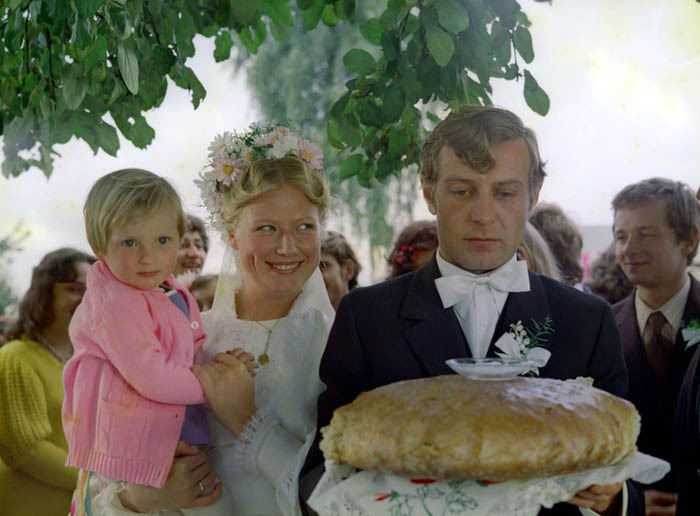 Many Polish wedding receptions still open with the traditional presentation of bread and salt. Upon the newlyweds’ arrival at the reception, their parents present them with these essentials. The bread is specially prepared and often decorated with the names of the couple. This gift of bread and salt is symbolic – bread is offered so that the couple may never know hunger, while salt reminds them of life’s difficulties and the importance of learning to cope. Following the bread and salt, the couple traditionally has their first toast. Customarily, the father of the bride or groom presents the couple with two glasses – one of vodka, one of water. They are offered first to the bride, who must make her selection without knowing which is which. Tradition says that whoever ends up with the glass of vodka will be the dominant partner in the relationship. After their drink (and the portent of their future dynamic), the couple throws their glasses; if they break, it is a sign of good luck. Around this time, you may notice that guests have begun to hand over envelopes of money to the bride and groom. While some couples have begun to register for gifts, giving cash is still more common. Even if handing over an envelope with a stack of bills feels a bit strange, take comfort knowing it certainly will be appreciated. With these traditional ceremonies out of the way, guests can look forward to the beginning of a very long, very filling evening. Current wedding guides advise that “for a standard wedding lasting about 12 hours, there are typically served between four and five hot entrees, along with appetizers, pastries, cake, and fruit.” So if you finish your first meal and think it wasn’t too filling, just wait…there’s more to come. The same wedding guide suggests a hot meal be served approximately every three hours. Menus will vary based on the tastes of specific couples, but guests can expect a spread of cold starters to include cheeses, meats, vegetables, pates and herring. There probably will be a soup…or two. Hot entrees might include grilled meats, roast chicken, smoked or baked fish, pork loin, tripe, hearty stews, potatoes and breads. Guests will also be treated to pastries, fruit and cake. The Polish presentation of wedding cake is quite similar to that in other parts of the world, with the bride and groom cutting the first pieces and feeding one another. All that food will be washed down with a seemingly endless supply of drink. The most popular beverage (as one might suspect) is vodka – and it flows freely throughout the night. 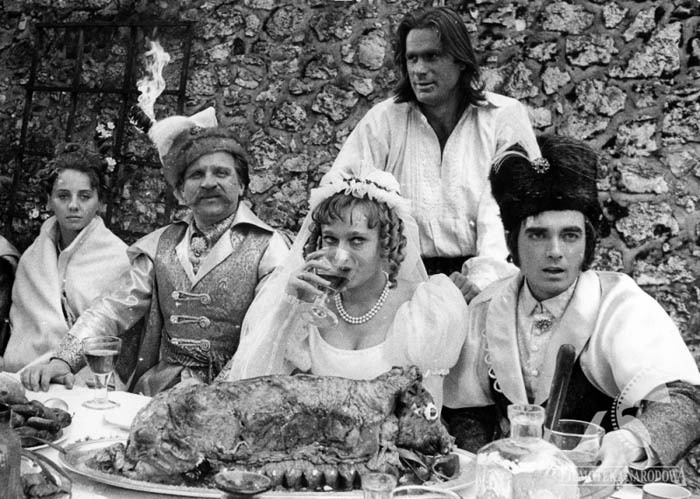 The gathering may spontaneously raise their glasses and start chanting “gorzko, gorzko!”, meaning “bitter, bitter!” in order to demand a kiss from the groom and bride – in other words to ask for some sugar. Where many weddings would be winding down as midnight approaches, a Polish wedding is just approaching one of its most traditional moments – the removal of the bridal veil. This ceremony, called “oczepiny”, traditionally represented the transitional moment for the bride as she moved from her single youth towards her married future. The midnight hour was significant as this time of transition. The details of the ceremony have changed significantly over the years, but it remains a memorable moment in many contemporary Polish weddings. 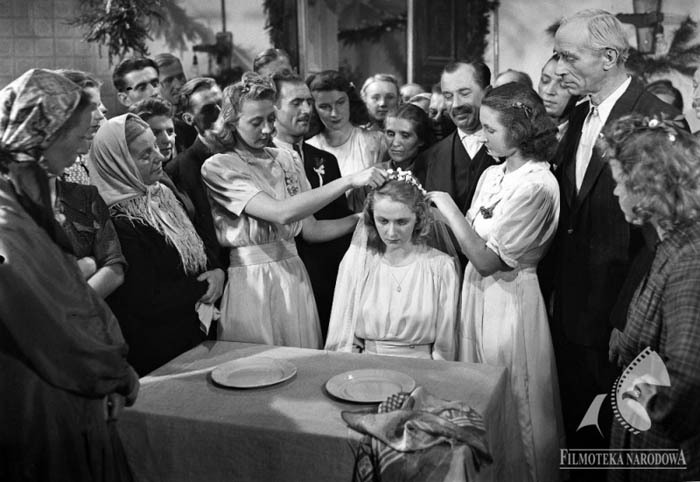 Traditionally, the oczepiny ceremony began with the unbraiding and cutting of the young bride’s hair. Long braids were symbolic of girlhood freedom; and as a newly married woman, the bride’s hair was unbraided to reflect her new marital status. With the unbraiding of her hair also came the removal of the bride’s wedding veil. The veil was exchanged for a special wedding cap, customarily a gift from the bride’s godmother. It is said that brides traditionally refused the cap three times, as it represented the loss of independence and youth. Once accepted, the cap became a special symbol of the marriage and was only worn on very special religious occasions. These days, not surprisingly, brides don’t often mark this occasion with a change in their hairstyle. The oczepiny has instead become a time for fun and games. The bride removes her veil and tosses it into a gathered crowd of single women. The groom also gets in on the fun – removing and throwing his tie to the assembled male guests. It is said that those who catch the tossed garments will be the next to marry (though not necessarily each other). After the removal of the veil and tie, the bride and groom might choose to play a number of games. The character of these games can vary – some couples play a little trivia game about one another. Other options involve guests in silly competitions or bawdy scavenger hunts. This traditional ritual has become a playful moment in contemporary Polish weddings. After the oczepiny, wedding receptions continue late into the night. Eating, dancing, drinking and toasting often last into the morning. As one can imagine, these 12-hour affairs can get rather spirited – and can be quite exhausting. Lasting through the night is certainly an accomplishment, but it does not mean your wedding experience is complete. Polish weddings can include a second day of partying, and historically some wedding parties lasted three or four days. 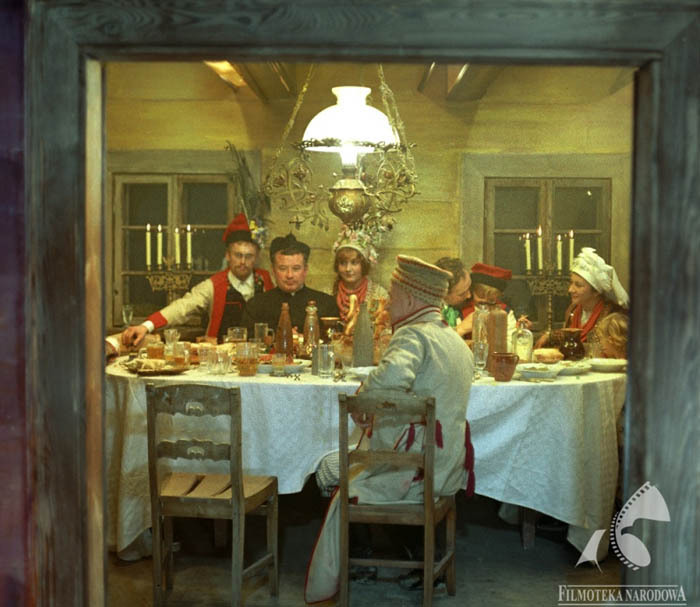 This follow-up reception – called “poprawiny” – typically consists of more eating, drinking and good cheer.